I've decide to give you a behind-the-scenes look at the old Sippican in his natural habitat, inhaling fumes in lieu of drinking Guinness. 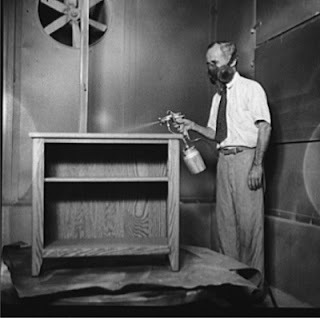 In this photo, you can see me applying "eco-friendly" finish to one of my creations. Not satisfied with simply having a carbon footprint as small as a clubfooted tse-tse fly, I've gone the extra mile and switched to only using finishes made from recycled radons, which I capture at night in the basement with a mining helmet and a dipnet. As you know, the radons are a multi-legged organism that scurries around unwholesome places like basements and state senators' mattress pads, and transmogrifies previously harmless substances into the carbon we all fear like dentists. By harvesting the radons only when their distended bellies signal a full load of the nasty stuff (we throw back the small ones) we ensure that we offset at least three quarters of a one-way plane ticket to a Climate Change Summit for one congressional staffer, as long as they don't weigh more than 89 pounds and don't have any luggage. Unpleasant people actually desire that the trip only get 3/4 of the way there, as it's in Bali, but we shun such naysayers, and redouble our efforts. Another beneficial side-effect of using the radons to coat the furniture is the gentle glow your furniture has in the dark of the night, allowing, perhaps, for your children to find their way to the unheated composting bathroom without the need for a carbon-spewing 2 watt light bulb in a nightlight for them. With us it's all subtraction, subtraction, subtraction. I'm sure you'll remark, of course, on my spraying costume. The tie does not have an industrial use, it's true, but I save a lot of paper by using it in lieu of a napkin at lunch. Win/win, as it looks rather jaunty blowing back in the radon breeze, like a WW I fighter pilot. So everyone, follow my lead and ask yourself: What have you done today to save the environment for the future generations of children you shouldn't have? I, only let the cars heater warm the interior to just above freezing before driving away. orange yew sposed to turn the fan on when you spray? But it is a snapshot, not a video, so duh. Although now I'm thinkin' New Year's. Seriously, I was hoping that your hiatus was due to lots and lots of Christmas orders.